The decrease in SO2 emissions from transport is significantly influenced by the tightening of legislation governing the concentration of sulphur in liquid fuels (since 2009, it has been limited to 10 mg/kg for both petrol and diesel). The limit value of concentration of sulphur in fuels used in road transport in 2015 was not exceeded in Slovenia or in the EU-28; the same applies to air and maritime transport. 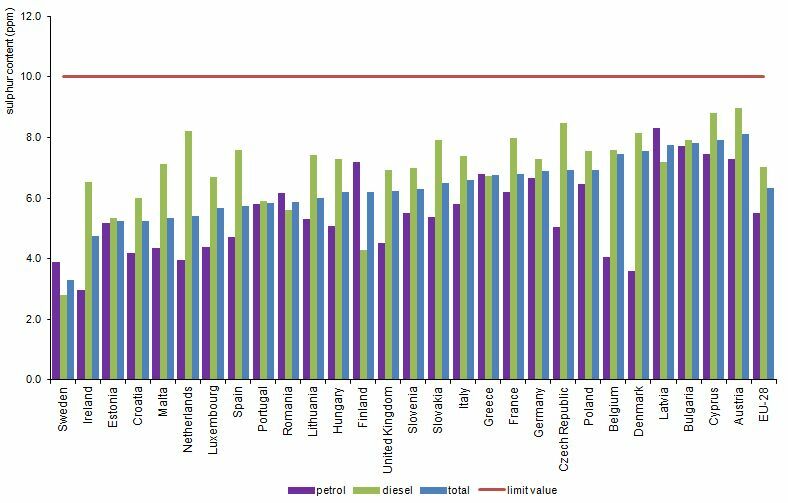 In the last several years, lead has no longer been present in liquid fuels (in road transport), while the benzene concentration in petrol has been below the prescribed value (1% V/V). This indicator shows the quality of fuels used in various transport modes in Slovenia and compares it with the quality of fuels in EU countries. The quality of liquid fuels in transport directly affects air quality. In order to reduce adverse impacts on the environment, the physical/chemical composition and characteristics of fuels must be maintained and air emissions resulting from combustion of liquid fuels must be reduced. In order to prevent excessive air emissions, limit values for content of certain substances (e.g. sulphur, lead and benzene) in liquid fuels have been prescribed. Fuels used in air and maritime/inland waterway transport contain sulphur, among other substances, while fuels used in road transport contain benzene (its content is extremely low) in addition to sulphur. Sulphur, which is naturally present in small concentrations in oil and coal, is a predominant source of sulphur dioxide emissions. In combustion of sulphur-containing fuels, SO2 is released into the atmosphere. Due to its acidic properties, it causes the formation of acidic compounds that are deposited in waters or on the ground. Acidification can have adverse impacts on river or lake ecosystems, forests, crops and other vegetation. As sulphur dioxide tends to oxidise as sulphates in the atmosphere, damage to buildings and cultural monuments is possible. It is also known that SO2 contributes to the formation of particulates (aerosols) in the atmosphere, which leads to the formation of mist and fog and, consequently, reduced visibility, particularly in urban and industrial areas. Lead is a toxic metal harmful to humans and the environment. The presence of lead in fuels prevents the functioning of catalytic converters that clean exhaust gases, which causes pollution of air with residual hydrocarbons, carbon monoxide, nitrogen oxides, methane and other harmful compounds. In Slovenia, the content of lead in petrol had been gradually decreasing since 1995, while in 2001, it was banned. Benzene is a carcinogen already present in small quantities in crude oil, while it is also generated in the technological production process of high octane components of gasoline. The most direct and efficient way of limiting benzene emissions is to reduce the content of benzene in liquid fuels. 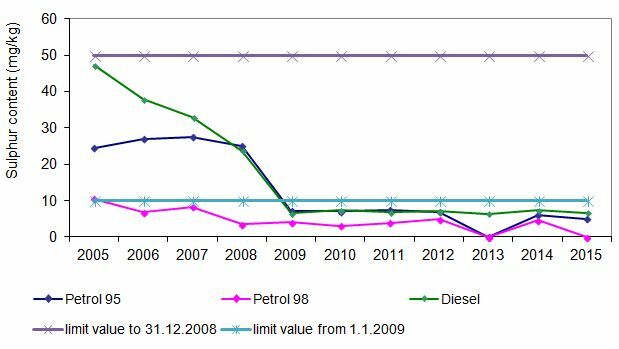 EU Fuel Quality Report, Slovenia 2005-2015. *Note to Figure PR17-1: the concentration of sulfur in the fuel 98 octane are shown only in the table since they can not be properly displayed on the graph due to prescribed format. *Note to Figure PR17-2: the concentration of sulfur in the fuel 98 octane are shown only in the table since they can not be properly displayed on the graph due to prescribed format. To reduce the emissions of sulphur dioxide resulting from the combustion of certain types of liquid fuels and thereby to reduce the harmful effects of such emissions on man and the environment (Council Directive 1999/32/ES relating to a reduction in the sulphur content of certain liquid fuels). The Decree on the physical and chemical properties of liquid fuels (Official Gazette of the Republic of Slovenia, Nos. 63/06, 92/06, 74/11) prescribes the permitted content of sulphur in gasoline and diesel. 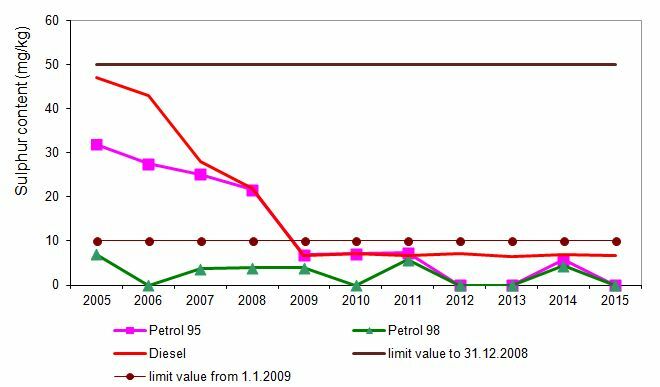 The permitted content up to the end of 2008 was 50 mg/kg of fuel, while since 1 January 2009, it has been 10 kg/mg of fuel. Directive 2009/30/EC stipulates that suppliers should, by 31 December 2020, gradually reduce life cycle greenhouse gas emissions by up to 10% per unit of energy from fuel and energy supplied. Directive 2009/28/EC defines a common framework for the promotion of the use of energy from renewable sources. According to the Directive, all Member States are required to obtain 10% of their transport fuels from renewable sources by 2020. Aviation fuels include kerosene JET A-1 and avgas 100 LL. The maximum permitted sulphur content in JET A-1 (Aviation Fuel Quality Requirements For Jointly Operated Systems/AFQRJOS or standard Def Stan 91-91) is 0.30% m/m (3000 mg/kg), while the permitted content in 100 LL fuel is 0.05% m/m (500 mg/kg) (standard Def Stan 91-90). As of 1 January 2008, the permitted sulphur content in ship fuels is 0.1% m/m for gas oil and 3.5% m/m for diesel (Marpol Convention, ISO standard 8217/2005 and ISO standard 8217/2010). In 2015, 108 samples of 95-octane petrol, 26 samples of 98-octane petrol and 151 samples of diesel were taken for the purposes of sulphur control in road transport. During the winter months in the period 2005–2015, the average measured content of sulphur in fuels used by road vehicles gradually decreased and eventually stabilised at very low levels in all types of fuel. 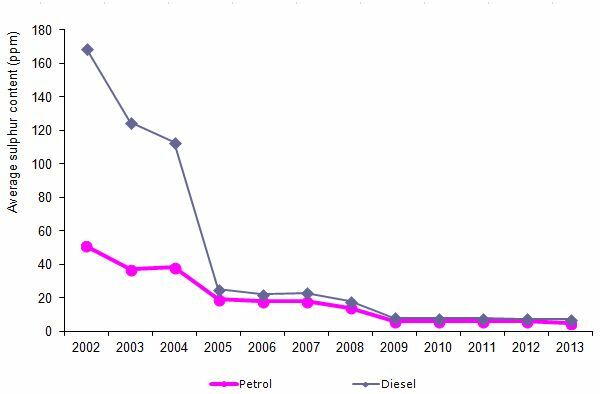 The content of sulphur in diesel fuel was 7 mg/kg in 2010, 7.1 mg/kg in 2012 and 6.5 mg/kg in 2015. 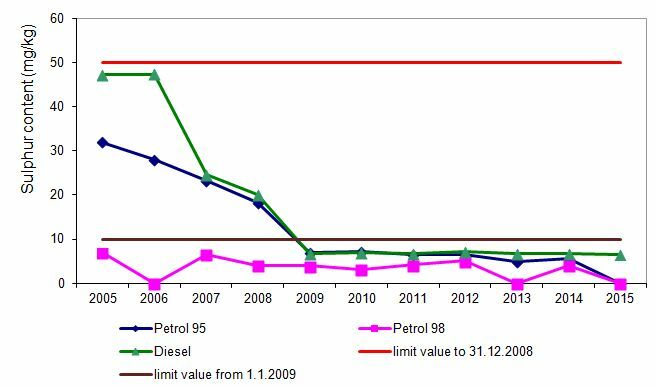 Sulphur content in petrol also decreased in the period 2005–2015. During the summer of 2015, the average measured sulphur content in NMB95 was 5 mg/kg, while in NMB95/100, most measured values were below the limit of detection (3 mg/kg). 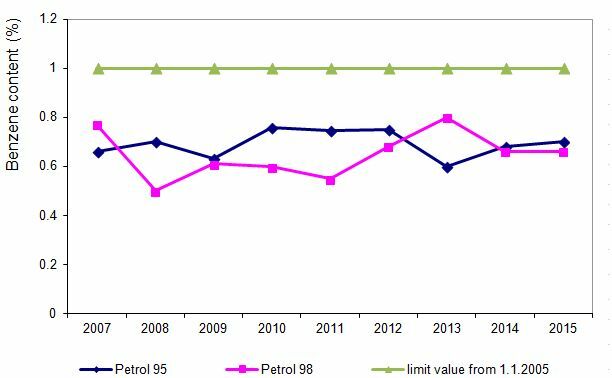 During the winter of the same year, many measured values in both types of petrol were below the limit of detection, which is why the average value could not be calculated. In diesel fuel, average sulphur content during the summer of 2015 was 6.7 mg/kg. There were no discernable differences between summer and winter sulphur content – the measured content was always below the limit value. The reduction in sulphur content is a result of the newly prescribed permitted content of sulphur in petrol and diesel fuels (10 mg/kg of fuel), which has been in force since 1 January 2009. In 2015, the permitted sulphur content in road transport was not exceeded in any of the fuels subject to control. Four samples of ship fuel were taken in 2015. Average sulphur content in ship fuels fluctuated only slightly in the period 2008–2015; in 2015, it amounted to 1.5% in diesel fuel and <0.003 % m/m in gas oil. 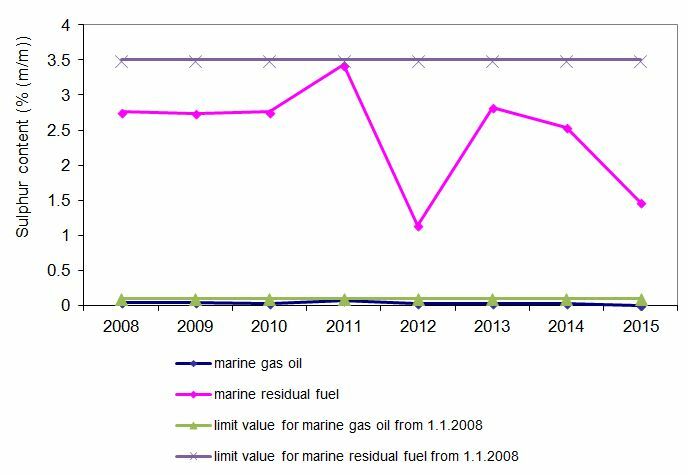 Permitted sulphur content in ship fuels (as of 1 January 2008) is 3.5% m/m for diesel and 0.1% m/m for gas oil and was not exceeded in 2015. In 2007, most EU-27 countries placed petrol and diesel fuels with sulphur content below 50 mg/kg on the market. Some Member States (Denmark, Finland, Germany, Hungary, the Netherlands and Sweden) placed sulphur-free petrol and diesel fuels on the market as early as 2006. The worst situation was found in Bulgaria, Luxemburg, Cyprus, Malta and Slovenia, where no sulphur-free fuels were available on the market in 2007. In the EU-27 countries, the content of sulphur was below 10 mg/kg in 47% of petrol fuels and 42% of diesel fuels in 2007. Non-compliance with specifications for fuels in road transport can cause increased emissions (e.g. exceeded quantities of oxygen compounds may cause an increase in NOx emissions) or even damage engines and exhaust after-treatment systems (excessive quantities of sulphur can damage catalytic converters), which increases emissions of air pollutants. As a result, Member States are required to introduce fuel quality control systems. Sulphur-free fuels (S < 10 mg/kg) in road transport have been compulsory since 2009. This will contribute to air quality improvement in cities. In 2014, the average sulphur content in fuels in the EU-28 countries was 5.2 ppm. The average value was 4.6 ppm for petrol and 6.2 ppm for diesel. In 2014, the highest average sulphur content in fuels was recorded in Austria (8.1 ppm) and the lowest in Sweden (3.3 ppm). Among hazardous substances in exhaust gases emitted by motor vehicles, lead is the most harmful to human health. It is a highly toxic heavy metal causing damaging effects to internal organs. The effects on children's nervous systems, which are manifested as reduced intelligence and lack of concentration, causing learning problems and behavioural disorders are the most characteristic effects. In Slovenia, lead emissions began to decrease in 1994 when catalytic converters became mandatory in new petrol-powered cars. Pricing policy also contributed through reduced prices of unleaded petrol. In July 2001, the content of lead in motor petrol used by road vehicles was limited to 0.05 mg/kg, while the use of lead in road-vehicle petrol was banned on 1 January 2005, thus eliminating the most common source of lead in Slovenia. Benzene is a volatile organic compound present in oil products. It has been proven to be carcinogenic to humans. Transport is the largest source of benzene. The most direct and efficient way of limiting benzene emissions is to reduce the content of benzene in liquid fuels. Benzene emissions have been reduced considerably due to the use of catalytic converters in petrol-powered cars. Driving vehicles with cold engines (or catalytic converters) has been proven to be especially problematic, representing a large problem in cities. In Slovenia, a notable reduction in benzene emissions was achieved in 2011 through the introduction of the European standard limiting benzene content in fuels to 1%. Accordingly, limit values of benzene concentration have not been exceeded since.